A 45 minute drive from Porto takes you past scenes of vineyards, old churches, and into the beautiful village of Amarante. Set on the snaking Rio Tâmega which is lined with willow trees, Amarante begs one to take a slow meander, holding your special one’s hand. You’ll see plenty of c0uples, young and old, doing the same thing. After all, this is the town of São Gonçalo, Portugal’s St. Valentine. Less romantically, you will see vendors selling keychains and candies shaped like penises. Perhaps if you’re single they will bring you luck and love. Being a Sunday (as it always is when we go anywhere – my weekend being Sunday and Monday), we were able to park in the city centre for free. We headed straight into the first cafe we saw and ordered a pineapple tart – Amarante is famous for its sweets. As we walked through the narrow cobbled streets towards the famous medieval bridge and a beautiful imposing church, we wished we’d had waited just a little longer. Here were specialist sweet shops, selling all kinds of local favourites such as papos de anjo, brisas do Tâmega, toucinho do céu, bolos de São Gonçalo, and galhofas, with pretty terraces on the river. Alas, we were too full. We walked down some steeep steps to the edge of the river, and walked under the bridge, admiring the pretty views of this time-trapped place. The vineyards all around make for a stunning vista. We walked back up to the top and strolled across the São Gonçalo bridge to the other side of the river…it’s an incredible old bridge, and even more incredible is that cars still use it – a shame really, it would be nice to have a car free Sunday. We explored the 16th Century São Gonçalo church, which was echoing not with the Lords prayer, but with the miserable sound of the Romani beggar outside repeating ‘moeda’ in long drawn-out tones that tugged the heartstrings. We walked up the street that skirted the river, little cake shops and restaurants and hostels that hid beautiful terraces behind over the river. We stopped at a cork shop to admire the bags, purses, keychains, hats, and even shoes skilfully made of cork. Carrying on up the hill we came to another church, a smaller one, and the bells were ringing to signal the end of the last worship time. Well-dressed locals were streaming out, in their Sunday best, off to the square by the bridge to have ice-cream and chat, as people here have done forever. We glimpsed inside the church and found it very pretty – all gold leaf and turquoise coloured paint. Hungry, we repaired to a little cafe run by a friendly ruddy-cheeked villager. They did pasta salad with tuna, so we had some of that. Recharged, we headed back to the square, and found a crepe shop, where we indulged our sweet teeth once more. Delicious. From here we headed down to the river again, watching the regal houses opposite turn shades of amber and pinks as the sun set, the little boats bobbing up and down with the scene of the bridge behind. Couples everywhere, holding hands, watching the same scenes, making plans….yes, Amarante is probably the romantic capital of Portugal. The final stop was a lovely riverside setting – Tilas Lounge Bar, where Veronica enjoyed a Mojito and I had a nice cold superbock, as the sun danced it’s last on the water. We had had a wonderful afternoon. 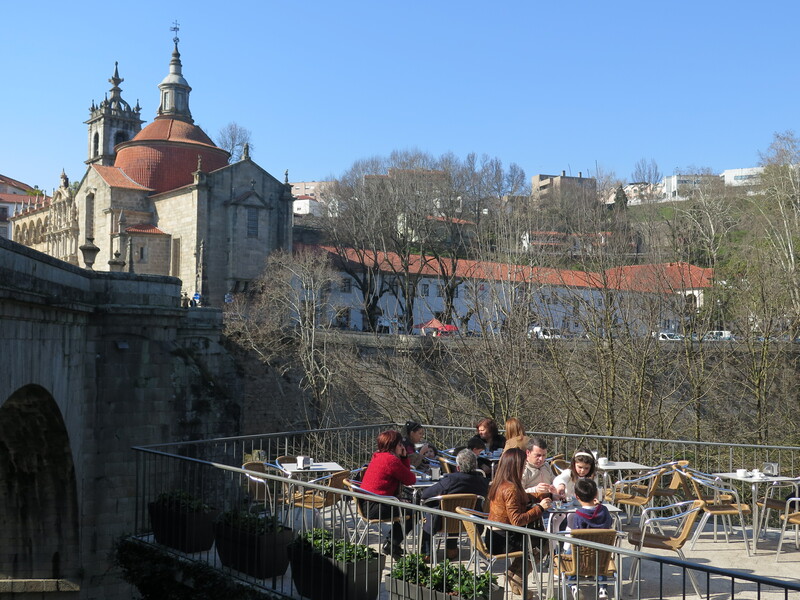 Amarante is well worth the visit if you’re staying in Porto.